If anyone knows about the Kelso Dunes — and I’ll wager not many do — then they know that one just doesn’t happen to “drive-by” these 650 foot tall sand dunes. Instead, you must plan to go there, even if for only a half hour, as I did this week. The plan was to drive home (Salt Lake City) from my step-mother’s house in Southern California via the Mojave National Preserve rather than the shorter but tedious I-10 to I-15 interstate route. Why? Because I wanted to see — and briefly photograph — the Kelso Dunes again. First, and last, there some 29 years ago, I had memories of climbing to the top of dunes for a sunset with my then girlfriend. We had camped in the nearby Providence Mountains and the austere, dry quiet of the Mojave had awed both of us. This was before the Preserve was established and the State of California created the Providence Mountains State Recreation Area (which, along with another 60+ state parks has been embarrassingly closed due to ‘deficit-reduction’ since 2008) and so toodling around in the desert carried more risk then then it does now. The roads were much rougher and pavement was much sparser. Now, heading north into the heart of the Mojave Desert on the Kelbaker Road in my father’s VW Passat and listening to his old Doobie Brothers and Blood, Sweat & Tears cassettes (thinking of you dad), the experience and goal were of a different nature. Rather than camp and hike, I planned to drive and shoot. Climbing past the aptly named Granite Mountains and descending the long straight grade after the pass, there lay the long line of amber-ish colored dunes to the west and the short 3 mile long graded dirt road to the trailhead. Of course many a visitor to National Parks execute true drive-bys. You’ve seen them, yes? They drive-up, stop the vehicle, perhaps turn-off the engine (but, probably not), and hold their point-and-shoot or smart phone at arm’s length, snap the digital shutter, climb back in the vehicle and disappear, heading to the next scenic spot where they are supposed to take a picture. I witnessed the ultimate drive-by last year when at the end of Chicken Corners Road in the Greater Canyonlands area — a partially 4WD road that takes 3-4 hours to drive one-way — a woman in the passenger side of a rented open-air jeep, said “awesome, just awesome” as she snapped a couple of frames, whilst the jeep turned around, and headed home again. The jeep didn’t stop and she didn’t get out. Is that not strange behavior of homo urbis? 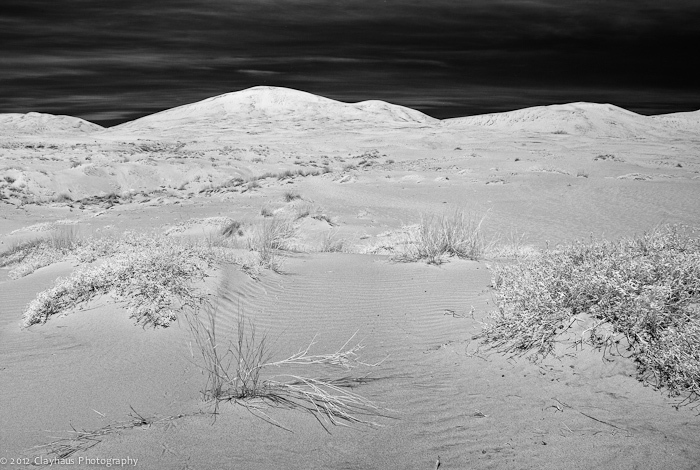 I don’t really do true drive-bys, so grabbing my Pentax K-5 and my infrared modified Pentax K10, I started trudging towards the main dune in the 80 degree heat. No plan really other than to find a spot closer and perhaps nicer to shoot a few frames. After 15-20 minutes I found a few sand ripples and clumps of greenery and though it was late morning and the sun was harsh, I documented my desert side trip on the long journey home. The numerous creosote bushes were sporting small yellow flowers but the persistent breeze played havoc with any attempt to photograph them, so I didn’t. The four shots here, though perhaps borderline repetitive, will hopefully give one a feel for the unique nature of these plant-stabilized dunes. Reportedly the oldest dunes (~25,000 years) in North America, and the third highest (after the Great Sand Dunes in Colorado and the Eureka Sand Dunes in Death Valley National Park), the Kelso Dunes really deserve more than a drive-by.